Write a c program to find length of a string without using strlen() function. In this programming questions, we have to write a code to find the length of a string. We can easily find the length of string using inbuilt strlen() function. Let's first find the length of a string using strlen() function. In this programming example, we first take an input string from a user and then we print the length of a string using an inbuilt strlen() function. In C, Every String is terminated with Null Character ('\0'). We can use this concept to traverse a string until null character is encountered. Once the null character is encountered we terminate the loop and print a count. 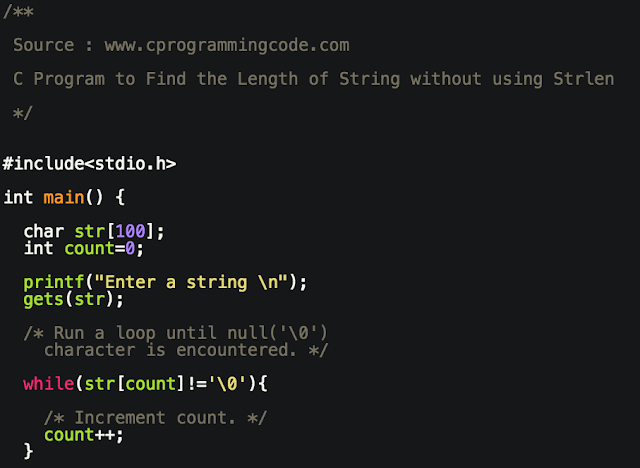 In the above example, we have written a code to print the length of a string using strlen(). In this example, we print the length of a string using while loop.